In June we are making a minimalist block. Marny of Modern Quilt Relish designed our block for this month. It does not have a name. We are going to use a "crayon box" palette. BOM Activity Group chairperson Shelly Recicar has also provided some additional brief instructions as well. Cut 7 – 8 strips ¾ to 1 ½ inch wide by 2 inches long. They should all be the same color but can be any basic crayon box color – red, yellow, blue, green, orange or purple. Sew them together to make a block roughly 7 x 2 inches. Cut one strip for your block ¾ “up to 1 ½” wide. Cut a piece of white fabric 7 x 7 inches. Cut this square in two any place you desire. Cut straight across not at an angle. The two sides do not need to be equal. Sew the strip between the two pieces of white fabric. Square up block to 6 ½ inches. Free cut strips of various shades of one color. 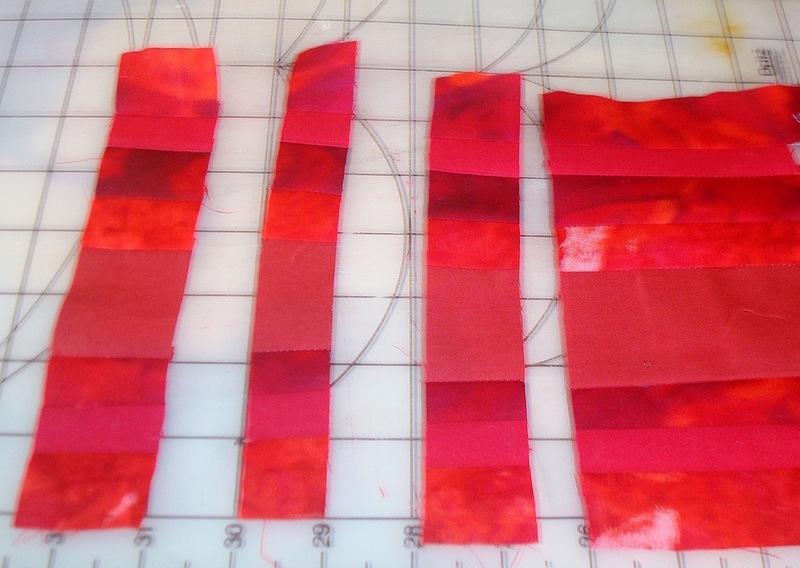 Sew your strips together to make a block. Cut your strip block into new strips, perpendicular to the seams. Slice across your white block and insert your colored strip. The colored strip should be monochromatic (various shades of one color) but you can make your strip any basic crayon box color – red, yellow, blue, green, purple or orange. Please use solid or tone on tone fabrics. No multi color prints. Our palette is a crayon box of primary colors. Use 50 weight neutral colored thread. Press after sewing each seam. Press towards the colored strip. Trim loose threads as you go. Tape your name to the back of your block, or mark your initials in the seam allowance. Quickly and easily make several blocks by cutting your strips in step 1 longer. Instead of 2 inches make it 4 or 5 and you will have enough for 3 to 5 additional blocks. At the June meeting, all finished blocks will be displayed and then placed into a raffle. Make several blocks and increase your chances of winning the draw! The winner keeps all of the blocks.